One of my favorite things to do in the holiday season, when my daughter was little, was to make Christmas crafts and let her take part in the process. 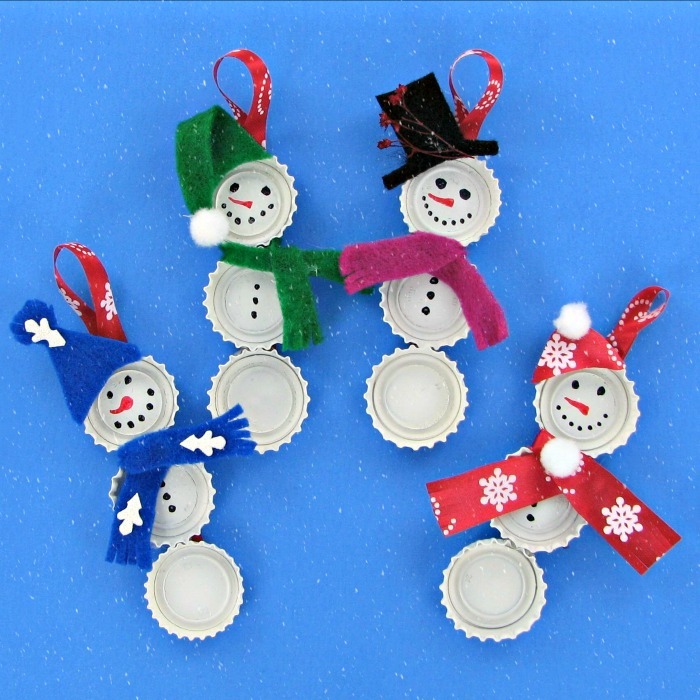 These little DIY bottle cap snowmen ornaments are very easy to make and the kids will really enjoy helping you put them together. I love making home decor projects by recycling common items that might otherwise end up in the trash. Today it is common bottle caps! 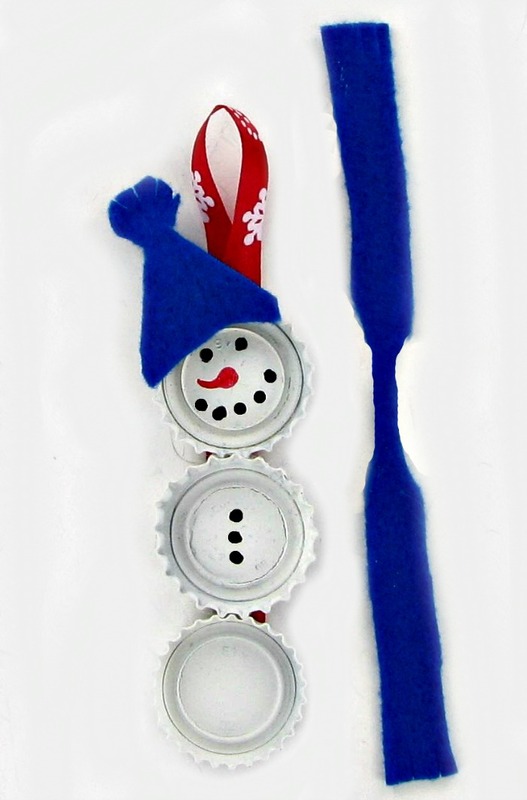 Each of these Bottle Cap Snowmen Ornaments is made from three bottle caps and few inexpensive craft supplies. They are all dressed up for the cold and ready to hang on your Christmas tree with pride. The first thing I did was to spray the bottle caps on both sides and let them completely dry. I used a white primer because I wanted a matte finish to the snowmen. Next, I used a fine point paint pen in both black and orange to paint the snowmen faces on the inside of four of the bottle caps. I also painted three pieces of coal on four more bottle caps. Putting the snowmen together takes two stages. First I hot glued each bottle cap to the one below it to attach three of them to each other – one face, one coal area and one plain bottle cap. The snowman ornaments are all finished but those little guys will freeze if we don’t give them some warm clothing now! This is the part that the kids will love. Just let them choose the colors for the snowmen hats and scarves and also have them pick out some other items to decorate the ornaments. To make the scarf sit better around the neck of the snowman, cut it a little narrower in this area. The ends of each scarf piece can also be cut to resemble a fringe. I used four different colors of felt, more of the Christmas ribbon and pom poms, as well as 1/2 of a snowflake sticker and a piece of dried flowers for decorations. 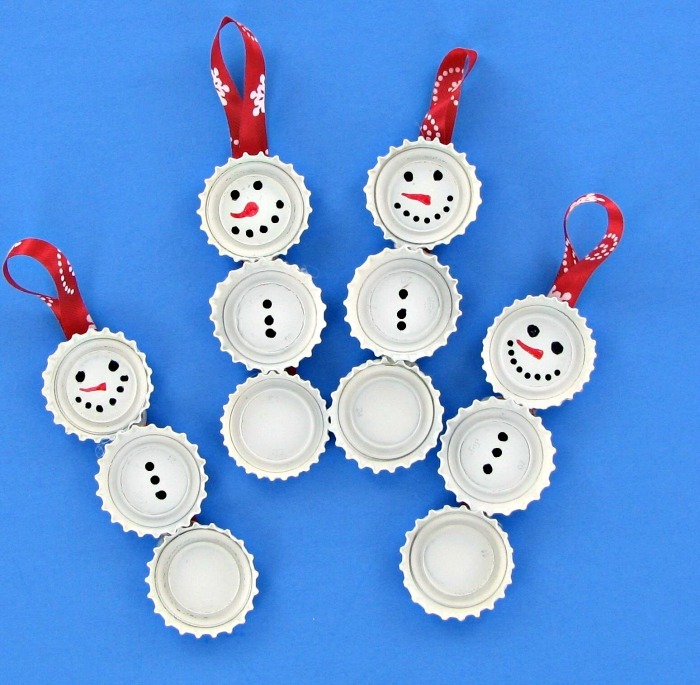 Here are the Bottle Cap Snowmen DIY ornaments, all dressed for the cold and ready to hang on your tree. 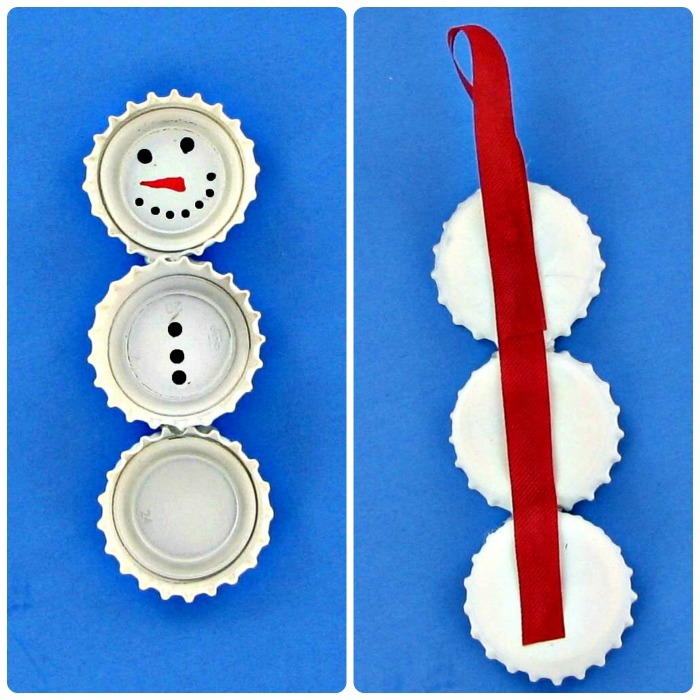 Would you like a reminder of this Bottle Cap Snowmen Ornaments project? Just pin this image to one of your Christmas Boards on Pinterest. 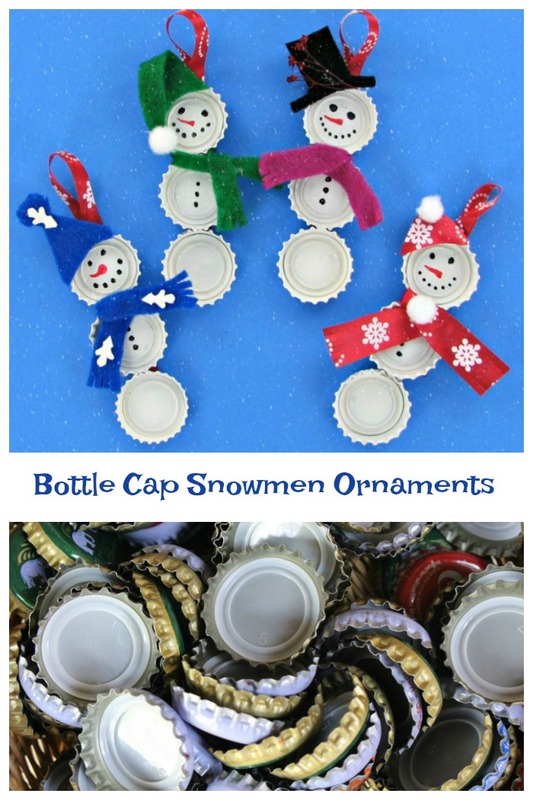 Admin note: This post for these DIY bottle cap snowmen ornaments first appeared on the blog in October of 2013. I have updated the post to add a printable project card and a video for you to enjoy. 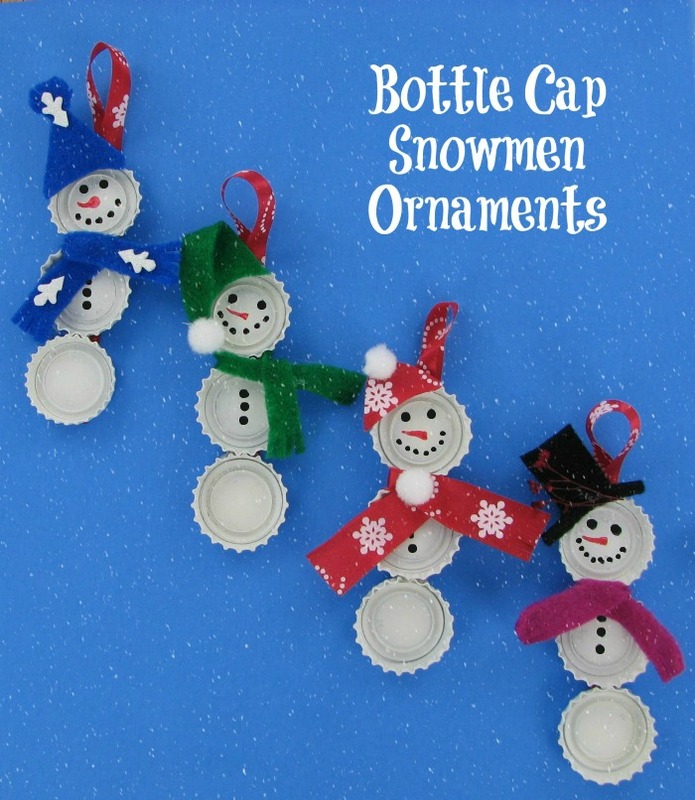 These adorable little snowman ornaments started out life on the top of a bottle, as a bottle cap! Use the white spray paint to spray the bottle caps on both sides. Use the black paint pens to add lumps of coal on four of the bottle caps. Attach a piece of red ribbon on the back of the snowman to use as a hanger. Cut a short piece of felt (about 3 inches long and make a notch in the middle on both sides to form a scarf. Wrap the neck of the snowman with a scarf and add a dab of glue to hold it in place. Use tiny snowflake stickers to decorate the end of the scarf.